Every year brings its own surprises in the garden. The weather is always the biggest wild card. Depending on conditions, certain plants can suffer or thrive. This year has proven to be the 'year of the giant tomato plants'. 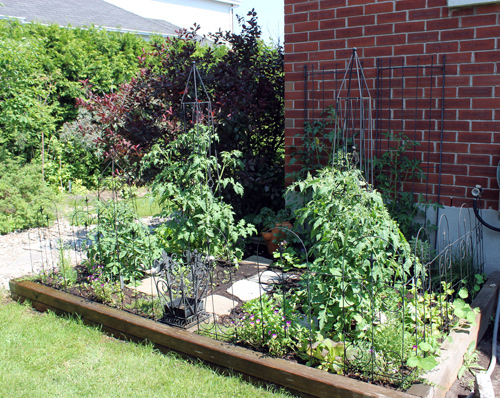 All that light and heat we have received so far has provided the tallest tomato plants I have ever had in my garden. The plants are actually taller than me right now and are full of tomatoes, green for now, but promising one of the most abundant harvests ever. I can't wait! I didn't plant that sunflower. A bird did. I just love its position, leaning out at the corner of the veggie garden, as if to say 'Welcome'! 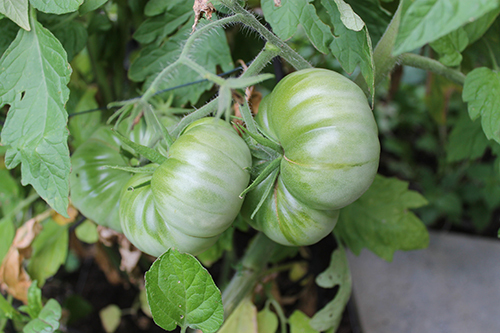 These are Opalka heirloom tomatoes. Isn't their pepper shape cool? Pineapple heirloom tomato. I am very intrigued by these and can't wait for them to ripen. 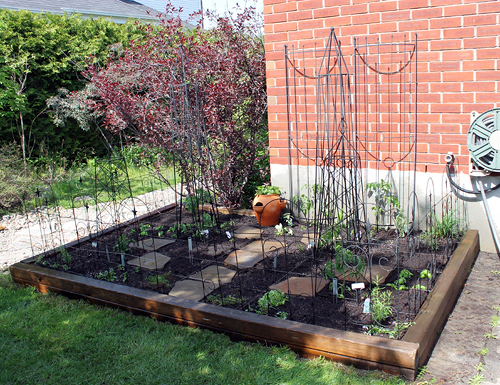 Look at how the veggie garden has changed since May! In June, a friend of mine asked if I would be willing to do a painting for her that she would give to friends in France when she visited them this summer. She wanted me to do a painting of their garden. That sounded like something I would like to do so I said yes. She obtained photos and gave three of them to me telling me to choose the one I preferred. Two of the photos focused mostly on a large, lovely coral-toned bungalow with a pool running the length of it. I chose the photo that showed a peek of the house and pool but more of the garden--an interesting tropical mixture of palm trees, pruned shrubs and flowers. And I have to say, those palm trees surprised me! When I think of a French garden, I have a different picture in my head--I guess mostly because we've visited the less temperate zones of France. If you have ever done a commissioned work, you'll know about the extra pressure it carries. In this case there was a double level: I wanted my friend to be happy with the painting as well as the final recipients. It's also challenging to work from someone else's photo (no two photographer's eyes are the same) of a place you've never visited. Plus I never want to simply replicate a photo. So I found myself holding my breath a lot when I did this painting. Meeko gave me moral support. He is getting better at resting quietly in my studio while I paint, although he is still a work in progress too. I tried to be true to most of the details of the scene while still making it look like one of my paintings. I infused it with more light. I guessed at some architectural features that were hidden by foliage in the photo. I tried to give it a happy feeling. I've shown you a few photos so you can see its progress as I built up the detail. The painting took me several days. I delivered the painting to my friend last Friday. She was pleased and I got a big hug. The painting travelled with her to France on the weekend and sometime in the next two weeks, it will be given to her friends. My fingers are crossed that they will be happy with my interpretation of their lovely property. When we were in New York, I was able to visit Anthropologie for the first time. I think I was grinning the whole time I was there. What a lovely store. I bought myself that beautiful yellow and blue mug in the top photo. And I also bought Geninne's gorgeous 'Write Everyday' Journal. Imagine meeting a friend from across the world in a place where neither of you live. Imagine that your friendship only existed on the internet before this face-to-face encounter. 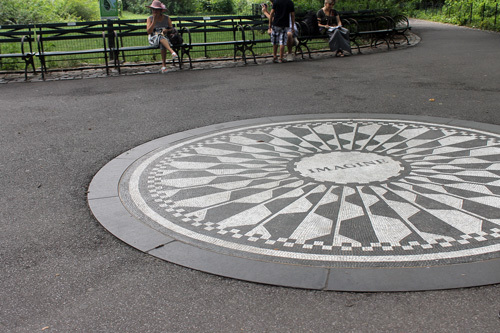 We met in Strawberry Fields, the garden dedicated to John Lennon in Central Park, on a scorching hot day in July. We waited for a little while awkwardly on opposite sides of the little garden before finally finding each other. Our only visual sense of each other were the blurry, far away photos that we had seen online. Oh yes, a definite highlight of my recent trip to New York was that I got to meet my sweet friend and fellow artist Lucile Prache from Paris and her two wonderful teenagers, Jeanne and Werner. Because we were both in New York on family vacations, we only spent a little bit of time together (a short visit to the Met including lunch one day and a visit to an art supply store and dinner at the Mario Batali restaurant Otto on the final night of our trip) but, as Lucile said, how amazing that two people who live so far away from each other were able to meet at all! we are at our glamourous best but we sure do look happy! Lucile is as warm and beautiful as I imagined her to be. She has a gentle manner and a great sense of humour and I immediately felt that we could have happily spent hours together. And she speaks English beautifully! (Did you hear that, Lucile?) 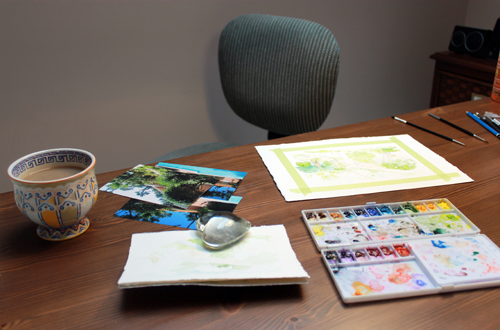 Now when I view her artwork (we own two of her originals and two prints), visit her Etsy shop and blog, or exchange emails with her, I will have a clear and lovely picture of my friend in my head. She surprised me with a thoughtful gift for the birthday that I'd celebrated a week earlier: a block of French Sennelier watercolour paper and a bamboo reed like the one she uses to write words on her gorgeous food paintings. Thank you and happy birthday to you too! Lucile celebrates her birthday on July 25th! A BIG anglophone hug to you, Jeanne and Werner! I am so happy to have met you all. And speaking of birthdays, my sweet and funny Chloé celebrated her 13th birthday on July 7th while we were in New York. I had trouble finding a 'normalish' photo of her. She seems to specialize in dramatic, crazy expressions these days. (I don't think she'd disagree.) I like this photo, even if a little hazy, taken with my iPod Touch the night of her birthday dinner at Otto. (We liked the restaurant so much we ate there twice.) Hard for me to believe that my youngest baby has turned into this tall, zany, beautiful and talented teenager. 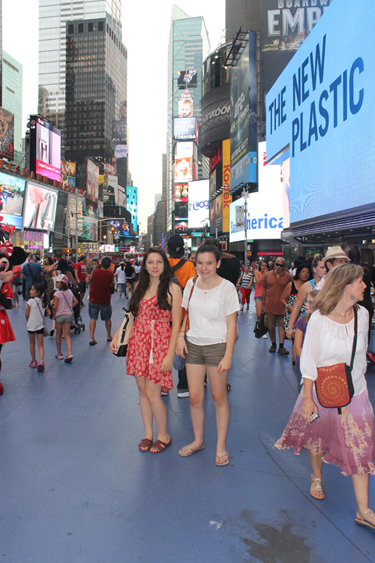 And just to complete the family picture, here's a photo of Emma and Chloé on Broadway. 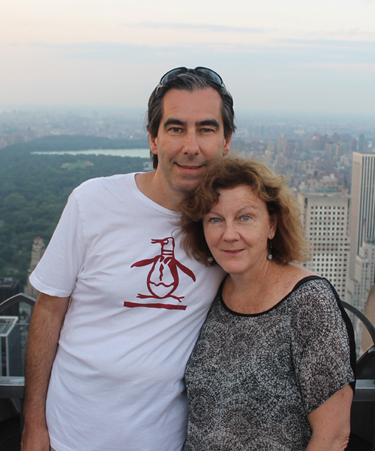 And a photo of Jocelyn and me taken at the top of the Rockefeller Center with Central Park in the background. This week, I am spending most of my time weeding rather than painting it seems. When I read of tangled, forgotten gardens being resurrected after years of neglect, I am in awe. Two to three weeks of neglect in my garden lets the weeds think that they are in charge. There are family visits in the weeks ahead. I need the garden to be ready for our days away. Hopefully I can squeeze in a little painting time every now and then too. I suffer from insomnia quite regularly, but I don't usually count sheep. I will toss and turn for a little while and then read until I'm sleepy again. 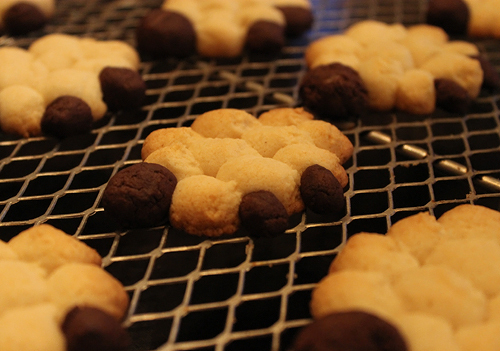 So I've established that I don't count sheep, but I sure do eat sheep when they are as cute and delicious as the cookies that Emma made this week. 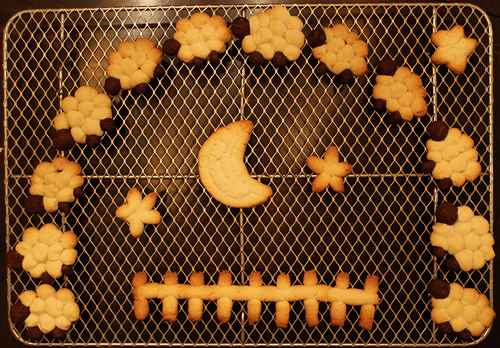 She found the cookie recipe in the book 1001 Cupcakes, Cookies & Other Tempting Treats and then she went one step further by creating a whole sheepscape (I think I've just invented a word) with a fence, the moon and some stars. The days since returning from our New York vacation have been busy. I have been working this whole week on a commissioned painting that I have to deliver tomorrow. I finished it at about 5:30 p.m. today. Phew! I have had double knots about it as it was commissioned by a friend to be delivered to her friends in France, so I want her to be happy as well as the final recipients. I will post a photo of the final version once it has been delivered into her hands tomorrow. Chloé has been at a one-week overnight camp for the first time this past week. We pick up the happy (I hope) camper tomorrow. I still have photos to sort and stories to tell about our Manhattan visit. Stay tuned. We spent six lovely, busy days in Manhattan. We did sightseeing, museum going, shopping, eating and walking, walking, walking. It was the first time in New York City for Chloé and Emma. We have been back since late Thursday but I am only just getting back into my daily routine. I had to get Chloé ready for camp. She left on Saturday. Meeko is not quite himself (maybe a little miffed at having been left behind) and it's been so darn hot that it is hard to do anything quickly or efficiently. I have a ton of photos to go through and will post more in the days ahead. I love the corridors of buildings in New York--old and new sandwiched together. My first visit there was many years ago when I was about 20. My visual knowledge of New York came from Woody Allen movies and I remember it was street scenes like this that didn't disappoint. We didn't go to Radio City Music Hall. We just walked past it. We did go see Mamma Mia at the Winter Garden Theatre. What a joyful, fun performance. I don't know what the name of this building is but Emma took a photo of it for me as she knew I would love the ornate scrollwork on its sides. Of course I took a photo of flowers. I love this photo of the afternoon light glowing through the trees just outside of the American Museum of Natural History. We also went to the Met and MOMA. I love museums. My favourite museum visit this time was, without a doubt, MOMA. Walking through the art museums made me ache to paint. There were so many interesting works and beautiful paintings to observe and absorb. I just hope that there are still little bits of them in me that will inspire me in the weeks ahead. Despite having been to New York many times before, I had never been to the top of the Empire State Building where I took the photo at the very top of this post. 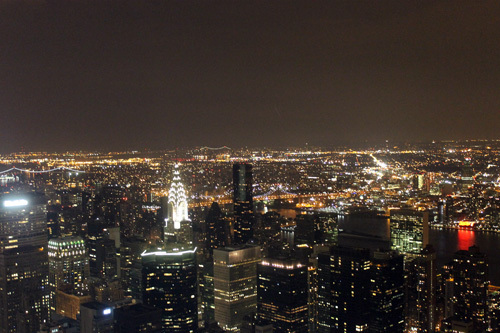 We also went to the 'Top of the Rock' for the first time--an observation deck at the top of the Rockefeller Center. I loved the city views from here, lower than the Empire State building and so slightly more intimate. We were lucky to have the most beautiful afternoon sky and watched it turn into an evening sunset over the Hudson. I tried to post some photos on Facebook when I was away using my iPad and iPod Touch. Neither worked. 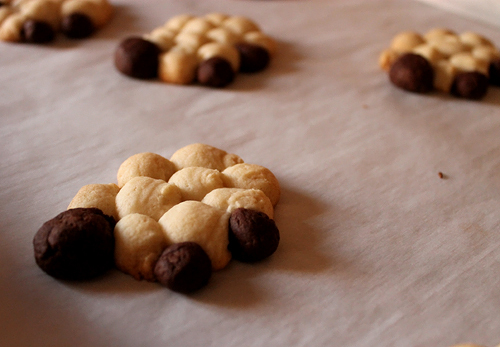 They appeared for a short time and then disappeared. I was frustrated at first and determined to figure out how to do it and then, upon reflection, took it as a message from the universe to take a little break from social media for awhile which is what I did. I haven't posted here. I haven't kept up with all of your blogs, but I missed you. I'll slowly catch up and post more about my trip in the days ahead. There has been so much going on lately that it's been hard to find painting time. The solution the past few mornings has been to make a cup of coffee and go up to my studio first thing while still in my pajamas. It has been working quite well as Jocelyn is long gone to work by that time and Emma and Chloé sleep in during the summer. The past few mornings I have left Meeko sleeping in his crate downstairs. But today, he stirred as I walked by his crate and I got brave and brought him up to the loft to sit with me. 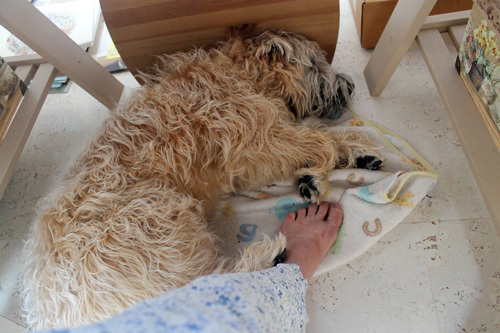 He was a little fidgety at first until I put my foot down right beside him (note his paw in turn touching my foot). He was very good and slept for about an hour and a half there. I couldn't have done this before without him gnawing on the furniture legs or consuming my watercolour paper. Emma made the comment recently that she thinks Meeko and I are co-dependent. I think she might be right. I am already missing him, just thinking about leaving him with the dog-sitter while we are away. I'm glad that I have been getting some painting time the past few mornings as I am working on a commissioned painting that will be hand-delivered (not by me) to France later this month. Here is a little peek at it in progress. It is about halfway done at this point: lots of detail, colour and contrast still to be added but the basic structure is there and I'm starting to 'feel' the place. It was a surprise initially when I received the photos as I didn't expect to see the palm trees. It has been interesting to paint a more tropical garden than I would normally. When out of my studio, I am getting us ready for our family trip to New York and Chloé for her first overnight summer camp (which happens almost immediately upon our return). We also have to leave the house relatively neat as my brother and his family will be using our place as a stopover on their drive out to PEI. I said that it is a family trip to New York, but it is more than that. I am going to meet my sweet friend Lucile for the first time. She will be visiting New York from Paris with her two children. Cannot wait! Happy 4th of July to everyone in the U.S.! A full and emotional weekend. Emma had her high school graduation ceremony and prom yesterday. I am so proud of the person she is. I have always stressed to my girls that what is important is inside and not just outside, but will you let me tell you how very beautiful she was yesterday? Did I cry at her ceremony? I cried before it even started when I tried to say a few words to her as she left to join her fellow students. Today was also special. For those of you who visit my blog from elsewhere, today is Canada's birthday. And it also happens to be my birthday although I feel like a youngster compared to her at 145. The photo at the top shows the birthday gifts I received in the mail from my sister Nancy and her family. 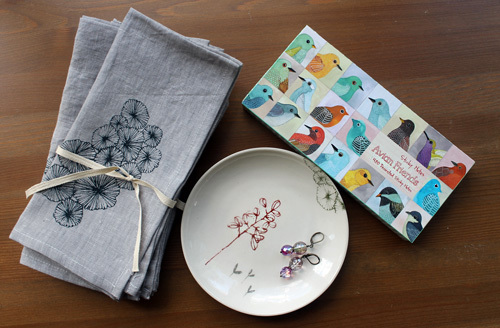 What a collection of beautiful things from people I love and admire: gorgeous earrings made by Nancy that I am wearing right now, napkins and a dish made by Bookhou and sticky notes featuring the beautiful paintings of Geninne. I'll admit it. I cried when I opened the gift.